was born in Romania and came in Paris when he was 20 years old. He studied uner Mercié and Boucher and exhibited at the Salon des Artistes Français from 1914 to 1928. 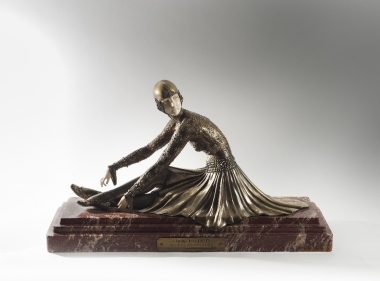 H is very well known for his statuettes and groups of dancing women, into bronze, gilded and enameled. Demeter Chiparus also developed the process of combining bronze and ivory to create wonderful chryséléphantine sculpture.